I saw my takeaway chef prepare his potatoes for his evening's service.First,in a big pan he put in some mixed veg oil and ghee,about half an inch deep into the pan.Then he added a heaped chef spoon of blended ginger and garlic paste,quickly followed by a handful of cumin seeds.Then went half a chef spoon of both cumin powder and turmeric followed by some salt.About two chef spoons of blended plum tomatoes followed by the potatoes and tiny bit of yellow colouring.This was cooked and for about ten minutes.He then put the lid on and then(which is something I've not seen before)he put the pan in the oven for about forty minutes to finish the cooking of.Here's the result.The oil and tomatoes had settled in the bottom of the pan,after they were cooled and stirred he put them into a large container underneath. Is there any water added to this JB ? No,definately no water added in this,the only liquid being the blended plum tomatoes.Whereas the pre cooked chicken is left floating in a mixture of oil,water and tomatoes this ends up drier.There's no need for a lot of water to cook the potatoes as most of the cooking is done in the oven. have you seen the pre cooked veg prepared? This was cooked and for about ten minutes. Can you clarify this sentence please JB? This was cooked and what? I guess the missing word is stirred but I might be wrong. I guess there is minimal liquid in the pan at this point of the process, so was the gas on low for those ten mins? My apologies.Quite correct they were stirred on a low pan just to stop the pan from burning.The main cooking process comes from putting the potatoes in the oven. Thanks JB, I will try this technique. I've seen panch phoran used for pre cooking potatoes too so I guess like everything else there will be variations in the approach of each restaurant, but the basic technique of bhagar to get some flavours going then oven cook looks like it's worth exploring. Potatoes are a bugger to cook sometimes without them breaking up, so the oven is probably a good choice so you don't have to stir them when they are getting soft. Big tick in the box for this one from me! I got to try it sooner than expected because when I came to portion out the 10 batch of bulk lamb madras I made today I found my precooked lamb was only going to stretch to 8 portions. A quick fry up of G&G, cumin seeds, panch phoran, salt and cumin & turmeric powders & dilute Tom puree and then into the frying pan went some potato chunks. I didn't really have enough potato to fry for ten mins without it getting too scorchio so I covered my pan with foil and popped it into a low oven at fan 130C for 50 mins. 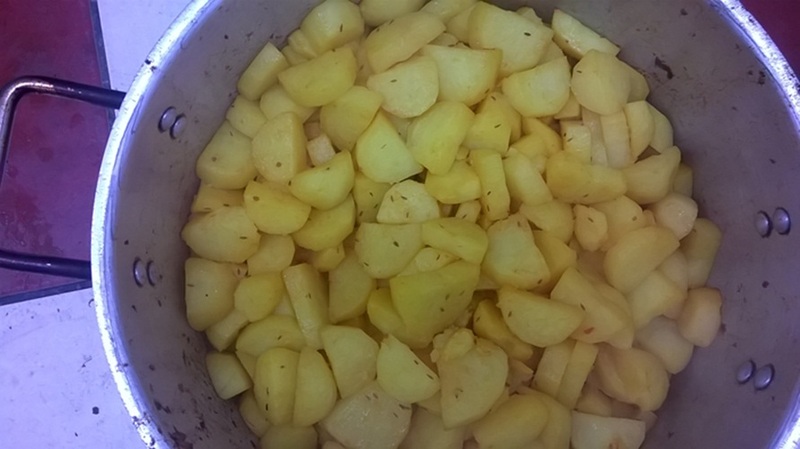 The result was lovely as the spices were nicely roasted and flavoursome and the potato was just right without being overcooked and mushy, as it might easily have been if boiled. 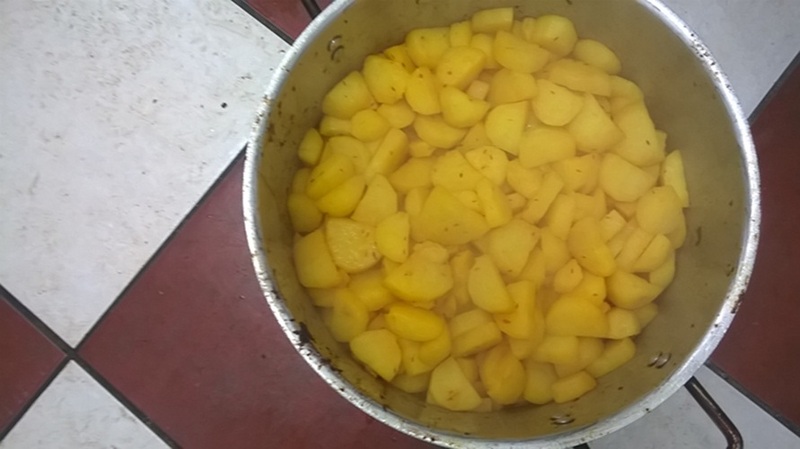 I think there was scope to drop down to 120C or 130C/40 mins as the potato would probably still get cooked enough. I've just polished off the first portion for an early dinner tonight and with a couple of chunks of potato included it was lovely grub. Thanks for the method jb, I can see myself using this plenty in the future.